As Bud Selig steps down as MLB commissioner, his tenure, though uneven and marked by notable mistakes, has overall seen numerous changes for the better in several areas. The ballpark building boom began before Selig took over as acting commissioner. The Blue Jays, White Sox and Orioles moved into their current ballparks in 1989, 1991 and April 1992, respectively, while the Indians broke ground on what has become Progressive Field in January 1992 and the Rangers did the same on their new home three months later. After he took over, 18 more new stadiums would be created, including two different ballparks for the Braves. As Selig leaves office, only the Rays and Athletics have failed to get a new home, and the gap between the condition, quality and revenue streams of their ballparks and those of the other 28 teams is striking. Those new stadiums — typically idiosyncratic and asymmetrical in downtown locations and with grass fields — have been both a financial and aesthetic success. However, the means by which most of them were built were questionable at best. More often than not, teams seeking new ballparks threatened to relocate if their cities refused to subsidize construction with public money. As a result, according to data compiled by Judith Grant Long of the University of Michigan, more than $8 billion of taxpayer money was directed toward the construction of baseball stadiums for MLB teams during Selig's tenure. Even AT&T Park, the only one of those 18 new stadiums to be built entirely with private money, sits on valuable bay-front property for which the team has not been charged by the city of San Francisco, which subsequently paid for $80 million worth of surrounding infrastructure improvements. Meanwhile, the promised economic impact of those ballparks for the communities in which they were built has been lacking. "For cities and the people who live in them, the economic benefits have been vanishingly close to zero, according to every independent economic study that's been conducted," Neil deMause, co-author of Field of Schemes, said in an email. Though Selig's habit of wrapping himself in Jackie Robinson's legacy could be considered distasteful, he nonetheless deserves to be remembered as a champion of diversity. Beyond the symbolic gestures of retiring Robinson's No. 42 throughout the game, establishing April 15 as an annual day to commemorate Robinson's breaking of the color barrier and launching the annual Civil Rights Game, Selig took the bold step of requiring teams to interview minority candidates for all vacant managerial and front-office positions. The direct impact of the so-called "Selig Rule" may have been mixed, with minority candidates too often being the subject of token interviews to satisfy the rule rather than being seen as serious candidates. Still, it kept the issue of minority hiring rates at the fore, rather than letting it become the subject of hot takes only when the likes of Al Campanis, Marge Schott or Donald Sterling reared their ugly, racist heads. In part as a result of that, MLB continues to score well on the annual Racial and Gender Report Card filed by the University of Florida's Institute for Diversity and Ethics in Sports. Last May, for the second straight year, MLB received an A for racial hiring practices throughout the sport. According to that report, 41.2 percent of major league coaching positions in 2013 were occupied by a person of color, an all-time high for the game. Diversity on the field has increased under Selig as well, with the growing presence of Latin American players and steady flow of Asian players, the later benefiting from the posting system established in 1998 and revised in late 2013. Expanding baseball's international reach was one of Selig's goals, resulting in outreach programs to China and India, among other nations, and the establishment in 2006 of the World Baseball Classic, which features teams representing countries from every continent. Meanwhile, MLB under Selig has attempted to reverse the decline in the number of African American players in the sport by supporting R.B.I. (Reviving Baseball in Inner Cities) and establishing Urban Youth Academies around the country and in Puerto Rico. Last July, Selig expanded his progressive civil rights legacy by appointing former player Billy Bean, who had come out as gay in 1999, as the game's first Ambassador for Inclusion, charging him with fostering a culture of acceptance in major and minor league clubhouses, laying the groundwork for the first openly gay player in professional baseball. In October, we found out that this was more than just a public relations move, as MLB has given domestic partner benefits to the partner (now husband) of umpire Dale Scott since 2010. It turns out Scott, who came out publicly in October, had been out to his colleagues and employers since at least the late 1990s. The defining event of Selig's tenure was inarguably the 1994 strike. The longest work-stoppage in major league history, the strike lasted 232 days, from Aug. 12, 1994 until April 2, 1995. It resulted in more than 900 games not being played and left Selig as the only commissioner to cancel a World Series. By striking, the players successfully prevented the owners from implementing a salary cap, but at great cost to the game, as attendance dipped dramatically in the wake of the strike and never fully returned for the league's two Canadian teams, one of which was forced to move a decade later. The argument has been made, most extensively and cogently in Howard Byrant's Juicing the Game (a book I edited), that baseball's desperation to bring fans back to baseball after the strike led directly to the offensive boom of the ensuing decade, a boom that rewrote the game's record books and perverted its history. That sequence of events — the strike, the ensuing offensive explosion (whatever its sources) and the collapse and relocation of the Montreal Expos — are unflattering aspects of Selig's legacy. However, Selig made sure that MLB, which prior to the strike had never adopted a new collective bargaining agreement without a work stoppage, never again let labor relations cancel as much as a spring training game on his watch. Though there was still some brinksmanship in 2002, when performance-enhancing-drug testing was the most contentious issue, baseball has since adopted four new CBAs -- in 1997, 2002, 2007 and 2011 -- without missing a game. The highlight of this era of labor peace came before Game 3 of the 2006 World Series, when Selig and Players Association head Don Fehr held a joint press conference to announce the signing of a new CBA two months in advance of the deadline for a new deal. 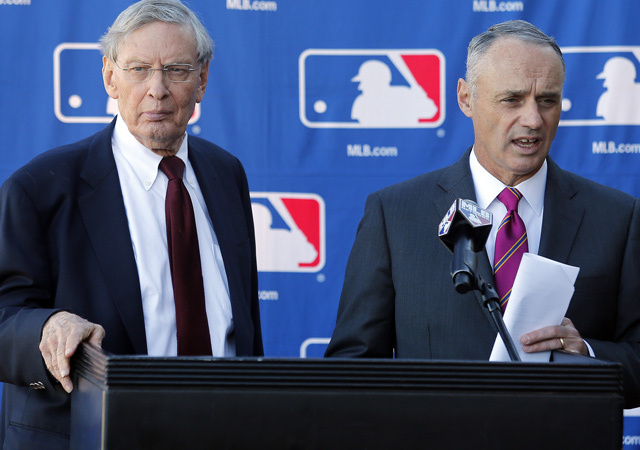 Rob Manfred (right) will take over the role of MLB commissioner from Bud Selig. Selig is the only former team owner to be named commissioner. His taking over the role was a clear message from the league's other owners about who truly controlled the office, which was originally created to have an independent arbiter who could serve above and separate from the league presidents and team owners. Nonetheless, Selig has occasionally had to assert his will when it comes to ownership decisions and the passing of teams from one person or group to another. The first time came in January 2002, when Selig orchestrated a sort of team-owner musical chairs that granted then-Marlins owner John Henry ownership of the Boston Red Sox, despite the fact that Henry's group did not submit the highest bid for the team, and allowed Expos owner Jeffrey Loria to buy the Marlins, leaving the Expos abandoned as a ward of Baseball. Given the Red Sox' success under Henry, one could argue Selig did indeed make his decision in the best interest of that franchise, but the Marlins' 2003 World Series championship seemed to come at the expense of both that organization, which would spend the ensuing decade as a penny-pinching embarrassment under Loria, and the Expos, who relocated to Washington after the 2004 season. ​Selig's next major ownership decision came in 2011, when MLB seized control of the Dodgers from owner Frank McCourt in April, then forced McCourt to sell in November after a year of messy divorce proceedings had crippled the team's finances. McCourt filed for bankruptcy and effectively held one of the game's signature franchises hostage to a high-stakes marital squabble. Drawn-out and ugly as that sequence of events was, it led to the acquisition of the team by a group headed by film mogul Peter Gruber, former Braves and Nationals president Stan Kasten and former Los Angeles Lakers star Magic Johnson. Flush with money, the Dodgers have since overtaken the Yankees as the team with the highest payroll in baseball and have won the NL Weest each of the past two seasons. Selig, however, has failed to make a similar move regarding the New York Mets. The Wilpon family's finances have been similarly compromised by a series of bad investments, most notably the involvement with notorious Ponzi scheme operator Bernie Madoff. The Mets have managed to improve modestly despite their financial limitations, but with the Wilpons still deeply in debt and trying to re-finance loans they can't afford to pay off, one of the two teams in MLB's largest market remains as compromised as the Dodgers were under McCourt. As much as Selig did accomplish during his time as commissioner, what he left unresolved in Oakland, Tampa Bay and Queens will very much be a part of his legacy, as well as his successor's. Baseball had a steroid problem before Selig became the acting commissioner, and in the years leading up to Selig's term as commissioner, the impact of performance-enhancing drugs on the game had become more pronounced. As a member of Baseball's Executive Council in 1991 and as acting commissioner in early 1994, Selig participated in discussions with fellow owners about the impact of steroids in baseball, and MLB did ask the players to adopt a testing program during the 1994 labor talks. However, the strike tabled that and all other issues and understandably distracted Selig from what was not yet considered a front-burner issue. However, despite the explosion of offense in the wake of the strike -- and some would argue because of it -- Selig did not return his attention to the matter until forced to by the discovery of androstenedione in Mark McGwire's locker by the Associate Press' Steve Wilstein in August 1998. By then, PED-using players like McGwire were already in the process of re-writing baseball's record book. McGwire hit 70 home runs that year, and Sammy Sosa, that year's National League MVP, hit 66, then 63 more the next year and 64 in 2001, when Barry Bonds broke McGwire's record with 73. In the spring of 2002, Ken Caminiti confessed to using steroids in his 1996 NL MVP season in a landmark Sports Illustrated exposé by Tom Verducci. All of that occurred under the 1997 CBA. Selig's insistence on including a PED testing program in the 2002 CBA and the Players Association's resistance to it brought the game to the brink of another strike that August. Selig got his drug testing program without a work stoppage, but by then he had been commissioner for a decade. Selig and the union have since strengthened the drug testing program several times, resulting in one of the toughest PED policies in sports and a corresponding decline in offense around the game, but drug scandals continued to haunt baseball. First there was the lengthy federal investigation of the Bay Area Laboratory Co-Operative (BALCO), which implicated such stars as Bonds, Jason Giambi and Gary Sheffield. In 2005, Canseco released his autobiography, Juiced, detailing his own steroid use and accusing several high-profile teammates on the A's and Rangers of doing the same. That same month, Selig, his deputies, union higher-ups and several players -- including McGwire, Sosa and Rafael Palmeiro -- were called before a congressional hearing on the topic of steroids in baseball. In 2006, the San Francisco Chronicle's Mark Fainaru-Wada and Lance Williams published a 300-page exposé on BALCO, detailing the steroid use of several players, most notably Bonds, who went on to break the all-time home run record of Selig's boyhood hero, Hank Aaron, in August 2007. That December, Senator George Mitchell, who was commissioned by Selig to investigate PED use in baseball, issued a 409-page report that alleged PED use by 89 players, including seven-time Cy Young award winner Roger Clemens. In February 2009, Alex Rodriguez confessed to using PEDs as a younger player. Later that year, Manny Ramirez became the highest-profile player to that point to receive a 50-game suspension for a positive PED test, and he failed another test in 2011. In 2012 and '13, the Biogenesis scandal, which found Selig and the commissioner's office dirtying its hands to collect information on players under suspicion, resulted in the largest mass suspension in the game's history. Fourteen players received bans, including former MVPs Ryan Braun (65 games) and Rodriguez, the latter of whom was initially slapped with a record 211-game penalty, only to have it reduced to 162 games by an arbitrator upon appeal. We'll never know to what degree a more proactive approach to PED prevention might have changed the course of baseball history, but it seems clear now that they will never be fully eradicated from the game. The repercussions of their impact are felt annually in the Hall of Fame voting, and nearly every season under Selig's watch was tainted to one degree or another by PED use. The negative impact of the 1994 strike has largely faded with time everywhere outside of Montreal, but it seems unlikely that the scars from baseball's Steroid Era will ever fully heal. While the strike and the taint of performance-enhancing drugs are the most controversial aspects of Selig's legacy, he had a more direct impact in the meaningful changes to the game that occurred during his tenure. Even without counting MLB's expansion into Denver and Miami in 1993, which was set in motion under Vincent, the degree of change has been staggering, especially for a sport that was often slow to innovate. Those changes started in 1994 with the realignment of each league into three divisions and the addition of the wild card and Division Series to the annual playoff picture. Only once since 1901 had such a radical change taken place: when the leagues split into two divisions and added the League Championship Series in 1969. In 1998, baseball expanded again, this time into Phoenix and Tampa, and realigned again, with the Brewers becoming the first team to switch leagues. In 2012, Selig added a second wild-card team, bringing the total number of clubs reaching the postseason from four in 1993 to 10 in his final three years at the helm and expanding the playoffs from two rounds to four. Selig also moved to consolidate the organizational structure of MLB, which had largely operated as two separate leagues since the National League recognized the American League as a fellow major league in 1901. Selig introduced interleague play in 1997, then eliminated the league offices entirely in 2000 and merged the umpires, who had previously worked exclusively in one league or the other. In 2013, he realigned the leagues again, this time moving the Astros to the AL, giving each league 15 teams and necessitating interleague play throughout the season, rather than as a novelty typically limited to the month of June. In 2001, Selig introduced the unbalanced schedule, which resulted in teams playing nearly half their games against intra-division opponents. In 2003, in response to the embarrassing All-Star Game tie in his home city of Milwaukee the previous July, he instituted a new rule giving homefield advantage in the World Series to the league that won the All-Star Game, a silly and ineffective attempt to give the Midsummer Classic additional importance. In 2008, MLB adopted instant replay for the first time, although it initially applied only to home run calls. The pace of change never slowed under Selig. His final three years brought all the moves listed above, the expansion of instant replay and the banning of home plate collisions. Add in the previously discussed posting system and drug testing, both of which were implemented and have since been revised under Selig, and the establishment of the competitive balance tax -- which was tentatively a part of the 1997 CBA and featured more prominently in the 2002 CBA -- and the amount of change Selig has brought to MLB is staggering and can be said to be unmatched by any other commissioner. Whether or not each of those changes was beneficial is a matter of personal taste, but the general consensus is that Selig has done more good than harm. As with his diversity policies, he has shown a surprisingly progressive attitude within a sport which had traditionally been resistant to change. Perhaps some of those alterations came too slowly for some observers. Perhaps some were too radical for others. But in stark contrast to his inaction on PEDs in his first decade in office, Selig has been proactive in preventing MLB from becoming an inflexible relic. Instead, he has fostered the tremendous financial growth of what is now a $9 billion industry despite the strike, the various PED scandals and the struggles of the American economy. If the bottom line is the bottom line, Selig's commissionership, despite its numerous shortcomings, has been a tremendous success.